I've been putting this one off mostly because I really wanted to do the subject justice. (Edit to add: Not that I think that I have, but I have been letting the perfect be the enemy of the good enough for too long now.) This is the campaign frame for Traveller that I myself most want to play in, or run if I must. 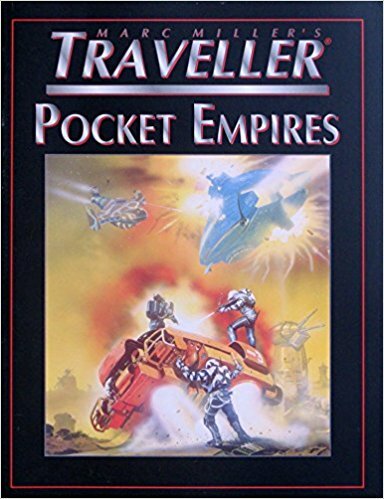 It has been generally unsupported in official Traveller products, with the closest being Adventure 5 Trillion Credit Squadron and the colonial economic model in World Tamer's Handbook (and don't get me wrong, those were good and potentially useful for the subject), but in the fourth edition, Marc Miller's Traveller (also called T4 for short), the supplement Pocket Empires came out. Oh, this was a joy for me to see. 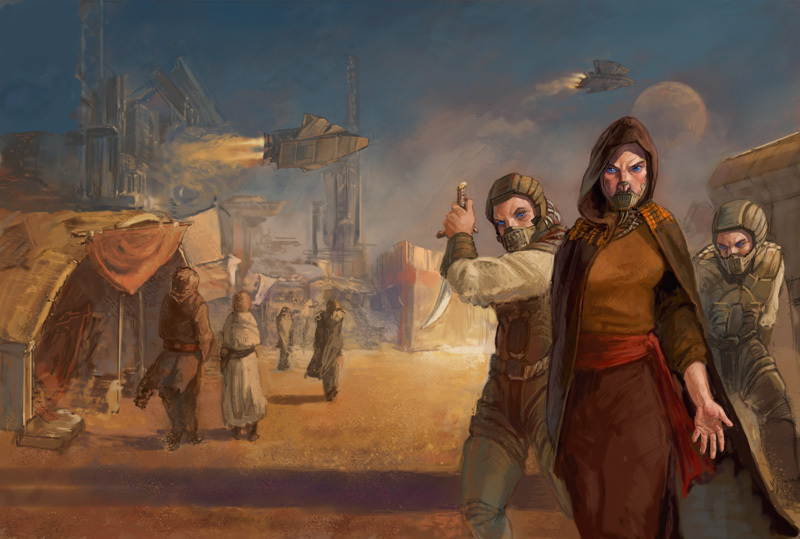 Finally, the game would support campaigns inspired by Dune and other sources involving high-level politics and intrigue. There were rules covering everything from the economic development of worlds to incorporating new worlds into your pocket empire to setting up and finalizing a marriage between members of your noble family and another one. Assassination attempts, espionage, politics on the floor of the Senate, all of these things were covered in the high-level game here. There were some weaknesses, of course. The basic game had a development turn a full year in length, which could lead to pretty severe discontinuities between the Pocket Empires layer and the roleplaying layer. The rules for voting factions in politics were a little rudimentary, but still serviceable. The military forces abstractions were perhaps a bit too abstract (although this was at least partly remedied with the addition of Imperial Squadrons, which was a major revision and update to T4 standards of Trillion Credit Squadron). The handling of corporations avoided many of the things that give that aspect of play its distinct flavor, with no insider trading, no boardroom politics, no shares changing hands, only what amounts to an abstracted hostile takeover and a few other simple tactics. Some of the elements of the noble life have been handled over the years. I mentioned a number of resources in the last installment of "Alternate Traveller Campaign Frames", and at least one more has appeared since then in the form of an article titled "The Influence Game", posted over at Wayhaven Traveller, which could be used to fix the lackluster politics rules in Pocket Empires. That really just leaves the problems of the speed of play and the generic, unfulfilling corporation rules. 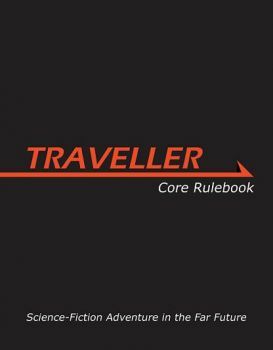 The corporations could be handled by looking at the rules on high finance and setting up and running corporations, getting them onto publicly traded markets, and so on that are found in GURPS Traveller: Far Trader, but it still misses the whole corporate struggle aspect as the authors left out the dirty tricks from the Stock Exchange floor. 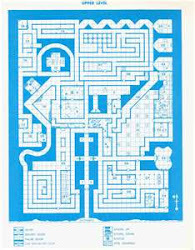 For that, we have to look further afield, to a supplement for the game TORG called Nippon Tech. That included a whole sequence of corporate warfare and a character type, the "Mega-corporation CEO", that could use it. Issuing junk bonds, taking advantage of insider trading, and most importantly the results of adventuring such as sabotage or stolen information are all embedded into the game as warfare against the opponents happens on the trading floor as much as in a firefight. A lot of these different layers include the idea of a turn length of a week to a month. It shouldn't be hard to incorporate that into the main Pocket Empires sequence. That would fit everything more tightly to the roleplaying layer of the campaign, which effectively has a "turn length" of one week, since that's how often Patron and Rumor checks are made, how long a Jump takes, and so on. All of this is important to me, as I am (slowly) working to convert Pocket Empires to MegaTraveller standards. I think that edition is the easiest to convert to any of the various other editions out there, so that it could be easily used with CT, CE, MgT, T5, or whatever. I intend to flesh out the corporate section and the politics especially, but also spend some more time on the military elements. Integrating it more completely with the roleplaying is my priority, of course. Setting out a specific method of generating the Noble House and its starting assets will be important too, as will working out ways to incorporate the players into the House. I forgot to mention GURPS Traveller: Nobles. That is another very useful resource, especially (but not only) if building your own setting. 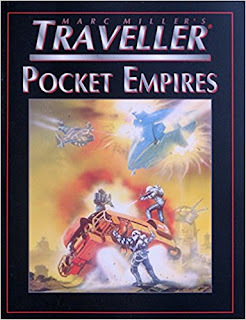 "GURPS Traveller: Far Trader ... still misses the whole corporate struggle aspect as the authors left out the dirty tricks from the Stock Exchange floor." It was not our area of expertise and had been done better by others, so we saved the word count. We recommend (p. 114) FASA's Corporate Shadowfiles (though the name got garbled in print). Yes, indeed! (Also, sorry for not putting this comment through earlier—it seems that Blogger isn't bothering to inform me anymore of comments being held for authorization.) I hope no one is reading that as a criticism of your excellent work, it was just a statement of something that I wanted but had to look elsewhere to find. Though, at the moment the project is on hold as I have other priorities fighting for my attention.